Between the Trochlea of the Humerus, trochlear notch of the ulna and between the capitulum of the humerus and superior aspect of the head of the radius. This envelopes the joint. It is attached to the humerus above the coronoid and radial fossa anteriorly, above (posteriorly) olecranon fossa and below the epicondyles laterally. Below it attached to the margins or coronoid and olecranon process of the ulna. Laterally it attaches to annular ligament. Annular ligament is attached to the anterior and posterior margins of the radiul notch and encircles the head of the radis. Synovial membrane lines the capsule. 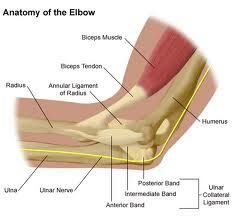 The Elbow and the superior radio-ulnar joints have a common cavity. Apex is attached to the medial epicondyle of the humerus and an anterior band passes forwards to the medial side of the coronoid process. A posterior band projects backward to the medial side of the olecranon process. A3rd band passes between these 2 points to form the base from the coronoid to the olecranon process. This is attached to the lateral epicondyle above. Below the base is attached to the annular ligament. Movements. – Hinge Joint (so there are 2 movements only).